KDE 4 is coming, it'll be our next major version but all this is possible only thanks to our contributors. Lot of them started contributing on their free time while still being students. We can get even more students contributing by proposing students projects in University. This talk will present a collaboration experiment conducted this year near Toulouse with the IUP ISI at the Paul Sabatier University. This talk will be structured in three parts described below. 1. Context and History of the IUP ISI student projects We'll explain how those projects fit in the IUP ISI course of study. How it's usually organized, the topics and technologies used. 2. Everything you want to know about this year projects Then we'll explain what got proposed to the IUP ISI director, and how it evolved from here. We'll give an insider view about which proposed activities worked or not. 3. Why and How? Finally, we'll cover why you'd want to find a university or a college next to you to propose a similar collaboration and ideas on how the concept could be adapted. 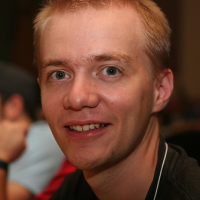 Kevin Ottens has been involved in the KDE project since 2003. He started with hardware interaction and kept improving the situation in this area since then. He also brought a few improvements in the file management department and helps maintain kdelibs. PhD student in computer science by day, and KDE developer by night, he tries to keep is sanity while driving the Solid effort.